Philadelphia is on the rise. But Philadelphia is no stranger to the struggles of poverty, hunger and homelessness. Last month, the 2015 Status Report on Hunger & Homelessness was released with headlines decrying the “shocking, unacceptable” conditions of hunger and homelessness in 22 of the nation’s cities, including Philadelphia. It is easy to read these sobering statistics, throw up our hands, and toss Philadelphia into the pile of Failed American Cities and get on with our day. But to do so would be to ignore the context of clear progress over the past few years in a city often rife with contradictions. Philadelphia is on the rise. We have been in national spotlight for the recent papal visit for the World Meeting of Families, Forbes annual “30 under 30” gathering and the upcoming Democratic National Convention. 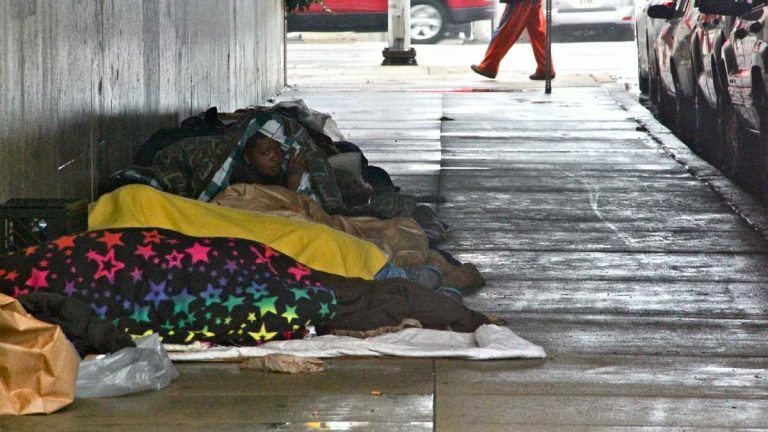 But Philadelphia is no stranger to the struggles of poverty, hunger and homelessness. Among the nation’s top 10 largest cities, Philadelphia has the highest percentage of people in poverty and deep poverty, defined as income of 50 percent or less of the poverty rate, which would be $12,000 or less annually for a family of four. This works out to be 26 percent of the city living in poverty and 12 percent living in deep poverty. Twenty-one percent of Philadelphians are food insecure. According to the 2015 Status Report on Hunger and Homelessness report, the number of requests for emergency food assistance has increased by 7 percent in Philadelphia over the past year, citing unemployment, low wages and poverty as the main reasons. Despite increasing the pounds of food donated and the budget in 2015, the city estimates that 10 percent of the need for emergency food assistance continues to be unmet. The number of homeless families and individuals in Philadelphia is expected to increase moderately, though the anticipated resources to provide emergency shelter over the next year will remain the same in the coming year. There are 96,000 people on the waiting list for affordable housing through the Philadelphia Housing Authority — an estimated wait time of 10 years. Almost one third of renter households spend 50% or more of their income each month on rent. Considered a severe housing cost burden, this puts many families one step away from homelessness in the event of unforeseen circumstances, like a sudden illness or job loss. Since 2012, the city has raised more than $250,000 to help soup kitchens serve more than 2,000 additional meals each week at 21 new meal times at existing facilities. 26 million pounds of food were distributed to people in need, representing an 8.7 percent increase over last year. Since August 2013, 1,390 Philadelphia veterans have been connected to permanent housing, effectively ending veteran homelessness. Set to reopen next week, the Hub of Hope in Suburban station has connected thousands of homeless people with housing support, medical care and other social services last year. Preliminary numbers for 2015 indicate the city gained 8,800 jobs, which would be the biggest single-year increase since 1999, though the rate of job growth (1.3 percent) still lags behind the national rate of 1.9 percent. Interestingly, the 2015 Pew State of the City Philadelphia poll is the most optimistic it has been in the six years of data. More than half of Philadelphians believe that the city is headed in the right direction, with two-thirds saying that Philadelphia will be a better place to live five years from now. The faith that we have in our city despite obstacles is a credit to our community and a reason to be optimistic in and of itself. This does not erase the fact that 400,000 citizens live below the poverty line, and 186,000 — including 60,000 children — are barely getting by on half of that. Hope is not enough. Realistic optimism means equal parts celebrating our successes and recognizing our ongoing challenges. With Mayor Jim Kenney officially taking office earlier this month, Philadelphia has a new opportunity to come together and collectively re-prioritize the most pressing issues that affect too many in the City of Brotherly Love. Melissa A. Reynolds is a project coordinator at Education Strategy Group, a consulting firm specializing in K-12, higher education, and workforce solutions. Previously, she was a policy analyst at the Mayor’s Office of Community Empowerment and Opportunity in Philadelphia, and an intern at the U.S. Department of Education in Washington, D.C.